One of the four O3b MEO satellites for Arianespace’s VS18 Soyuz launch is maneuvered inside the Spaceport’s S3B payload preparation facility. 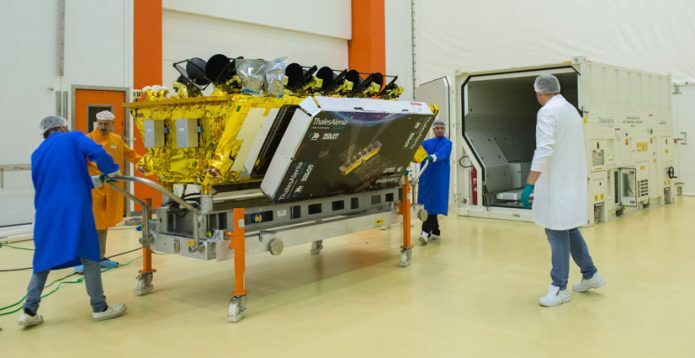 Arianespace’s fourth mission to loft O3b Medium Earth Orbit (MEO) satellites is set for March, with its four spacecraft and the Soyuz launch vehicle undergoing preparations at the Spaceport in French Guiana. Once orbited by Arianespace, the satellites will be operated by SES Networks to deliver the world’s only low latency, fibre-like connectivity in the growing mobility, fixed data and government markets. The trapezoidal-shaped Ka-band relay platforms have a liftoff mass of 700 kg. each, and were produced by Thales Alenia Space. 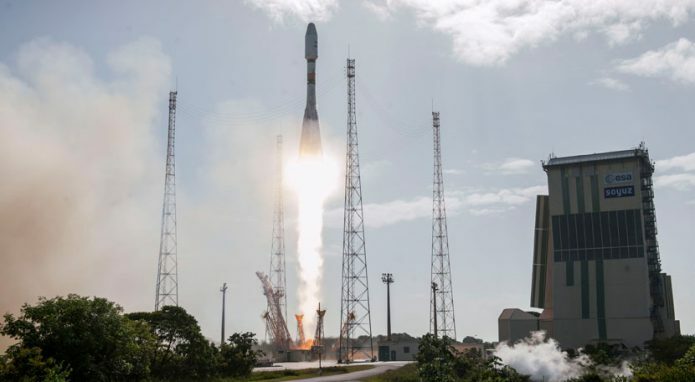 The current constellation of 12 O3b MEO satellites was orbited by Arianespace, utilizing its medium-lift Soyuz workhorse to carry four spacecraft each on launches that began in June 2013, and was followed by missions in July and December 2014. Arianespace’s upcoming Soyuz mission is designated VS18 in the company’s launcher family numbering system, denoting the 18th flight of the Russian-built launch vehicle since its introduction at the Spaceport in October 2011. A larger version of the photo above is available for downloading in the Gallery. More details are available in the VS18 launch kit.